Britain’s embattled Prime Minister said she’s fighting for her political life “with every fiber of my being” as dozens of Conservative MPs declared they have no confidence in her leadership. Theresa May has been struggling to rally support behind her draft of an agreement plan for the U.K. to withdraw from the European Union since it was signed in Brussels on Tuesday and published online Wednesday night. She took to the airwaves on Friday to directly address citizens’ concerns in a 30-minute phone-in on LBC radio. Britain’s Prime Minister Theresa May takes questions during a press conference inside 10 Downing Street in London, Thursday, Nov. 15, 2018. On Thursday morning, Brexit Secretary Dominic Raab resigned, saying he couldn’t support the plan, with a second cabinet secretary resigning shortly thereafter, followed by two junior ministers and a parliamentary aide. There are divisions between those who want the U.K. to cut most ties to the E.U., and those who campaigned to remain in the E.U. and now are advocating for a close relationship with the bloc for economic reasons. Both sides have issues with May’s plan with Brussels, which has been attacked as ceding too much control. In 2016, 52 percent of the U.K. voted to leave the E.U. after a divisive referendum. The question on the ballot paper simply asked whether the U.K. should remain or leave, and the country remains bitterly divided on the details of what the new relationship with Brussels should look like. On Thursday, May faced a grueling session in Parliament in which she took hostile questions for nearly three hours — anger and criticism from all sides of the Commons, including bruising attacks from her own members of Parliament. 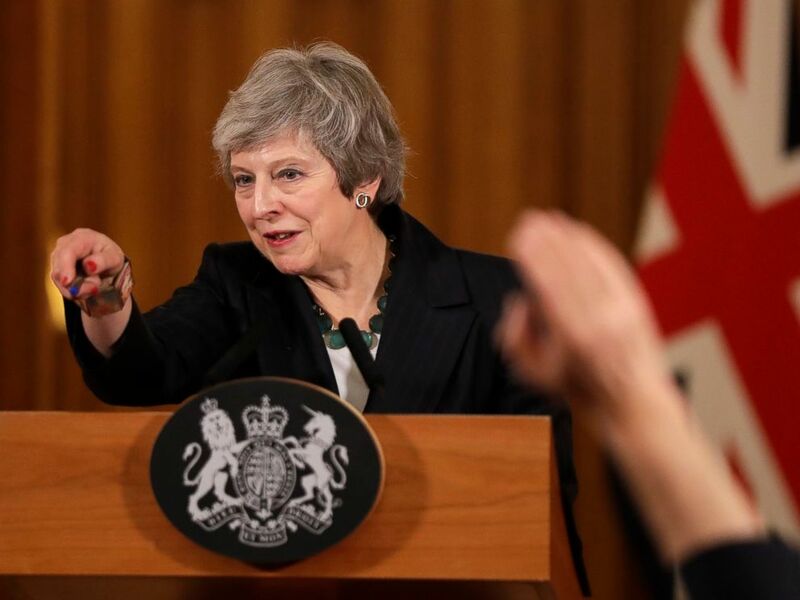 There were shouts of “Resign!” as she delivered her opening statement that argued the deal she’d negotiated was Britain’s best offer from Brussels. She later held a press conference at Downing Street and took questions from journalists, some of whom asked about the effectiveness of her leadership when her party appeared in open revolt. At the same time, an influential Conservative MP exited the Commons and announced he had written a letter to the chairman of an influential party committee saying he had no confidence in the PM’s leadership. Jacob Rees-Mogg chairs an influential group of around 60 Conservative MPs called the European Research Group. There is a mechanism whereby a leadership challenge may be triggered should the 1922 committee receive letters of no confidence in the party leader from 15 percent of Conservative MPs. As the party has 317 MPs, 48 letters would be required. It is unclear whether Graham Brady, the committee chairman, has received enough letters to cross that threshold.